How much is your Facebook fan page worth? A new tool has been launched by a Social Media Consultancy in the US, Virtue.com – which allows people to see the estimated worth of a Facebook fan page. The tool is in BETA and to have a go click here. The estimated value is determined by the number of fans, how much they are interacting with your Facebook fan page and also how much new material is going onto the page. 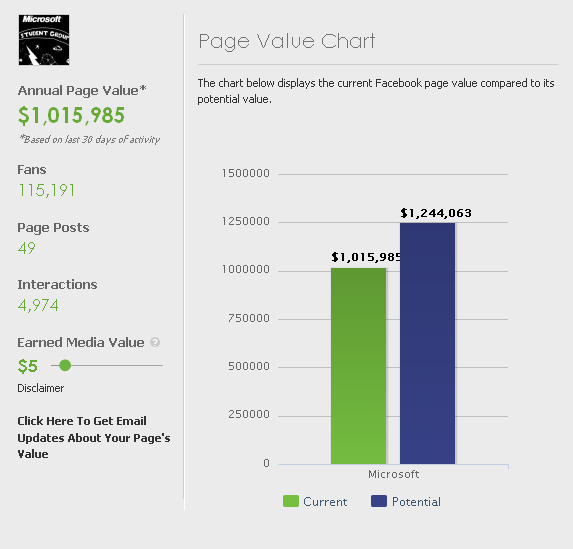 I ran a search for Microsoft’s fan page – facebook.com/microsoft and the tool gave me an estimated value of over $1 million, as below. Don’t expect an accurate or concrete value – but it is fun to determine the ‘value’ of large brands/how users are interacting to their Facebook campaigns.